Schedule and rates are subject to change. Click here for 2019 Live Music Cruise Band Schedule! A little background music, beautiful sunset and a cash bar. Available during the summer schedule only at 6:30 pm, Tuesday through Thursday. A fun time for all ages! Put a little swing in your step, or sit back and relax on a lazy Sunday afternoon. Available during the summer schedule only at 1:30 pm on Sundays. There’s nothing cooler than a great live band, watching the sun set, cruising the Canal. Available during the summer schedule only at 8:00 pm on Friday and Saturday evenings. We’re even trying a few Thursday this summer too! Click here for band schedule. The historic Cape Cod Canal’s only sightseeing cruise! We operate two and three hour sightseeing cruises, featuring live narration about the fascinating history and points of interest along the Canal. Points of interest include Massachusetts Maritime Academy, Sagamore Bridge, Bourne Bridge, Vertical Lift Railroad Bridge, Gray Gables, Herring Run, Aptucxet Trading Post, Scusset Beach Fish Pier, Sandwich Boat Basin and Cape Cod Bay. This man-made canal, a National Historic Civil Engineering landmark, is the widest sea level canal (without locks) in the world. It was built to create more efficient nautical trade routes, opening in July 1914. 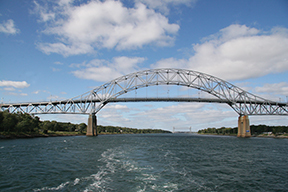 Passage through the Canal is safer than having to maneuver around the dangerous shoals and unpredictable currents surrounding the Outer Cape, and also saves ships more than 160 miles of travel, instead of having to navigate around the tip of Cape Cod. During the summer, we offer specialty cruises such as our KIDS RIDE FREE Family Cruise, Sunset Cocktail Cruise, Friends and Family Music Cruise, and a Live Music Cruise (21+)!